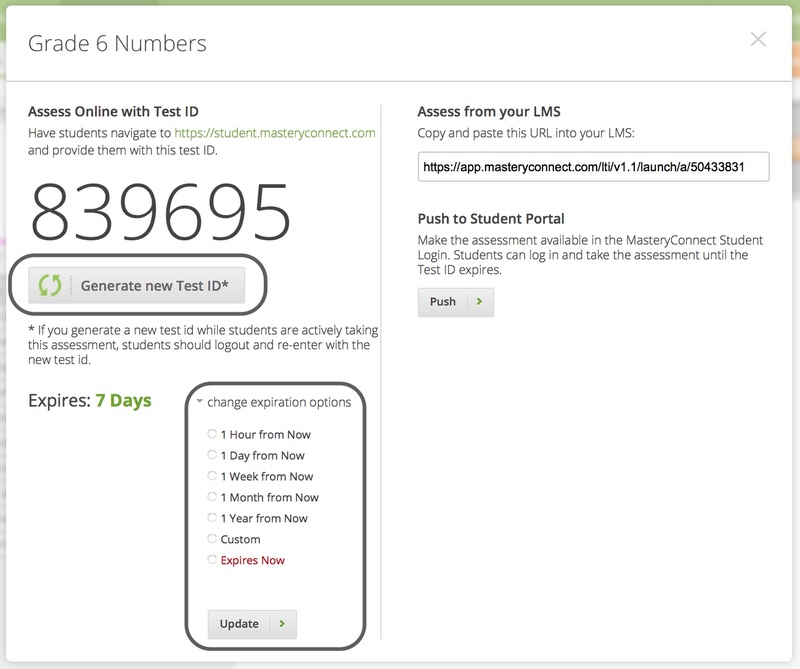 When you add an assessment to a standard, and make it assessment available to students, you can set an expiration date on the test ID. After this date, the assessment will no longer be available to students. First, you'll have to open the assessment in your tracker. To do this, click on Trackers. Find the test ID for your assessment by opening a tracker and clicking on the name of the standard (e.g. 6.RP.A.1) where your assessment is located. Click on Assess above the standard name to see the test ID. Note: If you're working with a multi-standard assessment, you'll have to click the title of the assessment and drill down to find the Assess button. You'll see the test ID for that assessment; you'll see dashes if one has not yet been generated. You may also see a status of Expired (in red letters); in these cases, simply click on Generate New Test ID to create a new test ID. Finally, click on Change Expiration Options and select the time frame for when you want the ID to expire.